1.I just learned about the recruitement gifts and im already level 21 so i missed the chance, are the gifts too many worth deleting account and remaking it and starting all over ? 2.Also im unlocking recipes but i dont see any new decks or cards , last one was a yellow sky anarda. Is this normal ? Am i just unlocking cards that i can win or something ? 3.I should go after pandora as much as i can yes ? This is the best thing to hunt ? Rewards. I don’t think it’s worth remaking an account. If you are just starting out Missions>Pandora>Chests but if you like Pandora over Missions than by all means play Pandora. Generally I wouldn’t spend gold on chests until I’ve unlocked all of the missions. As you complete missions and level up the game shows you different decks that you can make for the different colors. They are more of a guideline as you get new cards. They are only template or suggestion for decks, you don’t get any new cards with them. Yes that’s normal. You only get a possibly new card after every 10 levels or from chests. I don’t understand the loading screen thing. After you have completed solo missions, yes. Play practice pandora every day to learn the ropes and earn actual pandora coin. Preferably against other players but you can play against ai first if you don’t feel comfortable. in my decks only green red yellow and blue starters are there. should there be more from the recipes ? Are you talking about this screen? 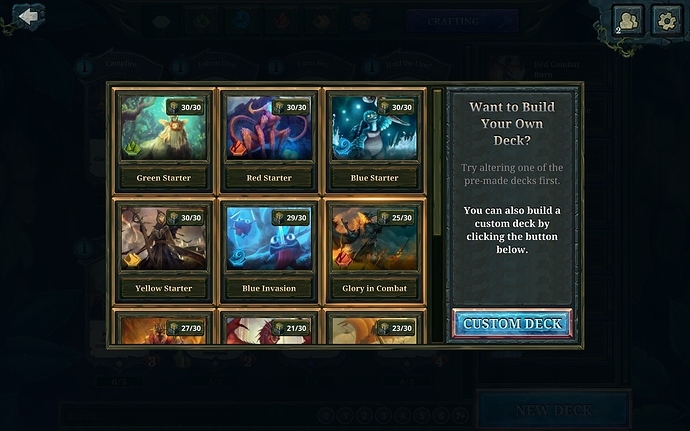 You will unlock more decks suggestion as you level up but you don’t have to follow those suggestions. Choose Custom Deck and make any you like with the cards in your collection currently. aw yeah i had to press on new to see them thanx ! why so many disconect before they’r about to lose ? on non-rated ? When you press the options button on the combat screen, you see 2 options - Surrender and Exit. Surrender takes you to the defeat screen and then the main page. Exit closes the game completely. I strongly suspect that those who disconnect are non-native English speakers who don’t understand the word surrender and press exit instead. This causes the game to “think” they’ve been disconnected. This is very frustrating for the opponent, who is forced to wait for over a minute to see their victory screen. I have been playing Faeria for about 2 months now. I’ve experienced only 2 or so genuine disconnections, reconnecting within 30 seconds or so. The other 10 or so have all been “defeat disconnections”, but as you have noted, never in Ranked mode. I missed my chance to recruit too. You can actually make a throwaway steam account to play Faeria anew. But, it actually takes a while to get to lvl 21. I don’t think it’s worth it, but that’s up to you. Most of your gold comes from Pandora, leveling up, or daily quests/rewards. There is no limit for any of these. When you get to level 100 it’s like going back to level 1 (easy to level up), so you can keep going and going. If you are level 21, check the top of your friends tab, it might not be too late, there should be a space where you can type a name, that’s how you recruit someone. There are cards in my decks, that have flowery onraments at the left side of the card. The game is not mentioning anything about it, and the cards aren’t better in fighting than the normal ones. I hope, you can help me, and want to thank you. Do you mean the cards with golden borders? They are mythic cards, purely cosmetics for collecting, no gameplay difference.